Poncelet is one of the six best cheese shops in the world according to the prestigious British magazine Speciality Food in its 2018 report. 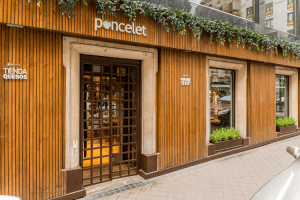 Poncelet, based in Madrid, Spain, is a cheese shop that has a unique and pioneering maturation center and its success story is based on a combination of craftsmanship, innovation, quality, attention to detail and exquisite customer service. 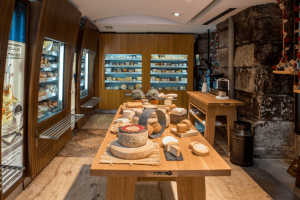 We interviewed Jesús Pombo, owner of Poncelet, who explains what has been the key to the success of this cheese shop and how they’ve managed to boost their business in the market. The magazine Speciality Food selected Poncelet as one of the six best cheese shops in the world. What makes Poncelet different? Poncelet, throughout its history, has focused on promoting the culture of artisan cheese. We’ve also become an authority on cheese maturation, promoting artisan cheese culture to the public who visits us along with the role of the cheese maturer, either in our store, restaurant or simply through our blogs and web pages. Our maturation center, an up and coming and unique enterprise in Spain, is where all of our cheeses are matured through different techniques until they reach their optimum flavor. Only then can each artisan cheese be fully enjoyed on an organoleptic level. From our maturation caves, we send the cheese to all our centers as well as to the rest of the customers, keeping them in their best condition at all times. It’s in our store where we put all our dedication and commitment to customer service, making sure everyone who comes in is helped by our highly qualified, professional and friendly staff. Likewise, the care and dedication to the product, as well as the rest of the elements in our store, is done carefully with love and is a fundamental part of our work. In short, what distinguishes us is the quality of our perfectly ripened cheeses accompanied by careful treatment and exceptional dedication to the visualization of the product as well as our knowledge of the cheese culture we share with all of our visitors. What’s next for Poncelet in the next 5 years? At Poncelet, we’re constantly evolving and looking for new farmers and artisan cheese makers that share our philosophy. As a result of our tireless work, we’ve just incorporated a new selection of unusual cheeses that both experts and “amateurs” will love. Our selection of cheeses is continually renewed and we find new and surprising techniques, new cheeses or new ways to produce high-quality cheeses. Since each time the culture and knowledge around this food are higher and more demanding, new methods come about, as well as new textures, aromas and flavors. It’s our duty to continue looking for those cheeses that make us different, as well as learn, study and experience new ripening techniques. This is what distinguishes us from the competition. Since one of our premises is to marry tradition with innovation and modernity, we’re adapting new technological concepts to our work through different programs and computer applications. We’re providing more and more information to our clients and adjusting all the times and internal procedures to achieve greater efficiency and better performance in all aspects. What marketing channels does Poncelet use to gain more visibility? Social media platforms are a fundamental tool that we think is necessary to continue to grow our business and directly interact with our clients. We also provide all the information that different media and blogs request, always trying to meet all their demands. We do our best to ensure that, in each publication, Poncelet has the image and scope it deserves. Currently, it’s the off-line medium, but every day this is decreasing, while the online medium grows each day. Poncelet has a blog. What role does the blog play in your marketing strategy? Making all the news, events, courses, tastings and the rest of our company’s activities accessible to the public through our blog is important. This keeps our clients well-informed. That’s why we have our newsletter, which is sent periodically to each of our loyal customers. What advice would you give to a specialized food company that has problems acquiring new customers? Firstly, you have to be clear about who you want to address, in terms of both the food you offer and in your communication with/for them. Secondly, you have to make sure the message and the story you transmit is “real.” Otherwise your clients will quickly see any inconsistencies between what you say and what you finally offer. Now the giants of e-Commerce are entering the food sector making deliveries to homes in as little as one hour. What impact will these giants and their strategies have for specialized food stores? With the pace of life we ​​have, it’s more than understandable that changes in plans and the creation of new events arise in a moment. That’s why we believe that, in this sense, the almost immediate online sale of food will grow quickly and we have to be prepared for it and do our part. We always ask people to make a prediction. How do you see the specialized food sector and its immediate future? More specialized and with a more demanding culinary culture. This is a good thing for the entire sector.